Today, we would like to celebrate the 100th birthday of our Lifetime Member, Al Boston! 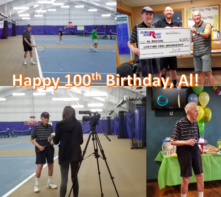 Al is a great example of living life to the fullest and staying active at any age. We hope you have an amazing day, Al! Love your family and friends at Columbia Basin Racquet Club!